I have been sitting on a rib recipe since Saturday, but I was a little brain-dead from too much vodka at an open-bar wedding on Sunday. In my hung over state I also had to give the dog a bath and scrub the whole house from top to bottom because little Kirk brought millions of his friends into the house. Flea-bath and headaches don’t mix, really not fun! 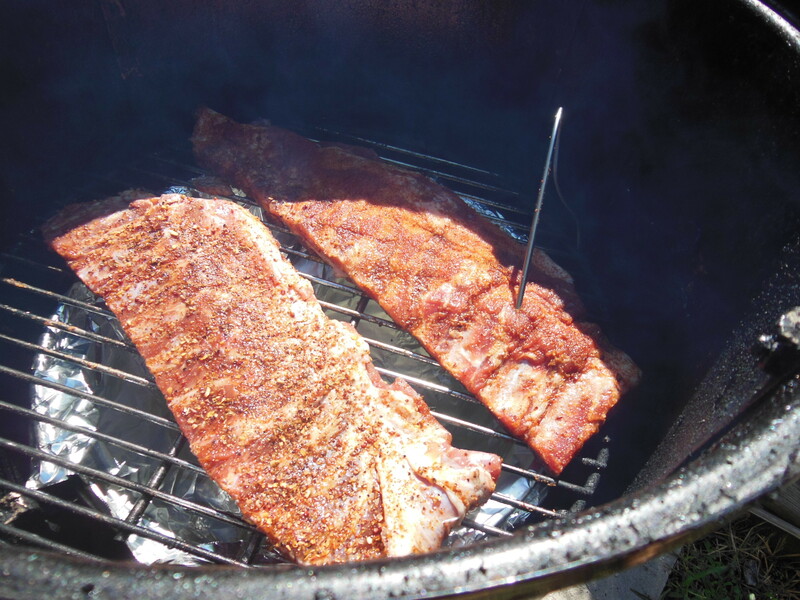 So, now that I have reluctantly de-fleaed the kids and house, it is time to give you the basic rules for ribs. Amazing ribs are one of the BBQ holy grails. Like brisket, something that you will not get perfect the first time around, but that’s ok, barbecue takes practice. 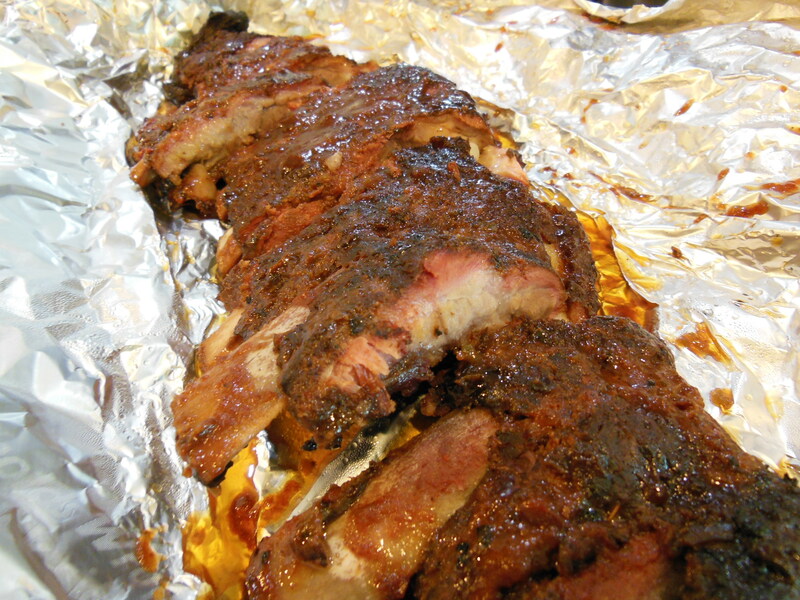 Rib recipes are like fingerprints, everyone has them and they are all a little different. This is not a specific recipe, but instead they are instructions for the novice to follow. Once you have mastered the basic rib we will get all technical with the fancy recipes! That beautiful pink hue is the smoke ring! Something you will never get if you take shortcuts! We started with 2 slabs of pork ribs and carefully cut off the silver skin, also called the “membrane.” We used hickory smoke for these little piggies, but just about any wood would work here except for mesquite, because it might be too bitter and intense for this particular cut of meat. Next we added the rub, which is a bit of a misnomer, because I don’t want you to actually rub it in, so it should be called a pat. You can use whatever rub you like, or a generous sprinkle of garlic, salt, pepper, cumin, paprika, and onion powder will do as well. 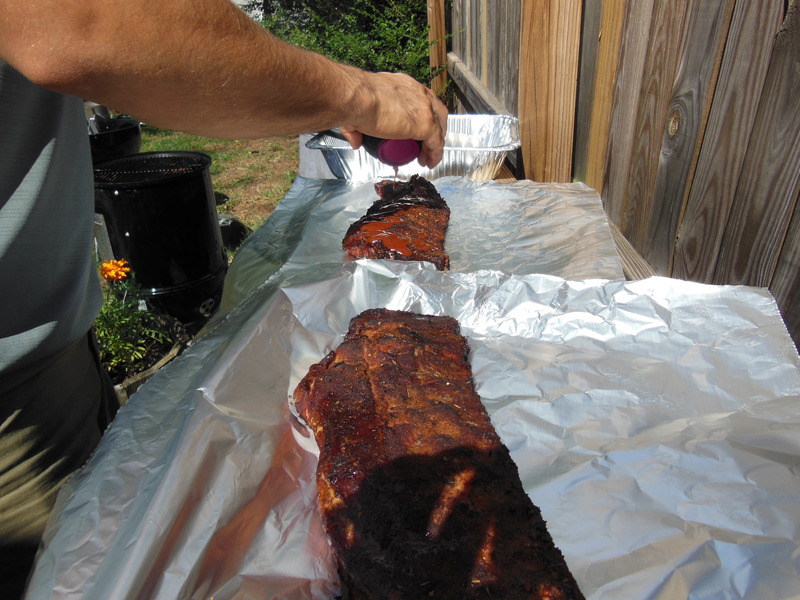 Pat your rub onto both sides of the meat really well and let them come to room temp while you start up the smoker. 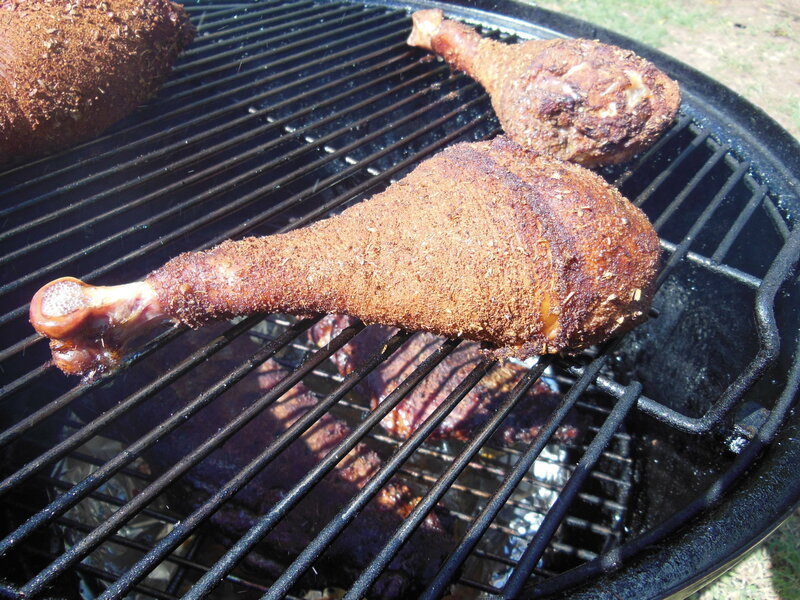 The ideal temperature of the smoker is 225F, but anything under 250F will do. 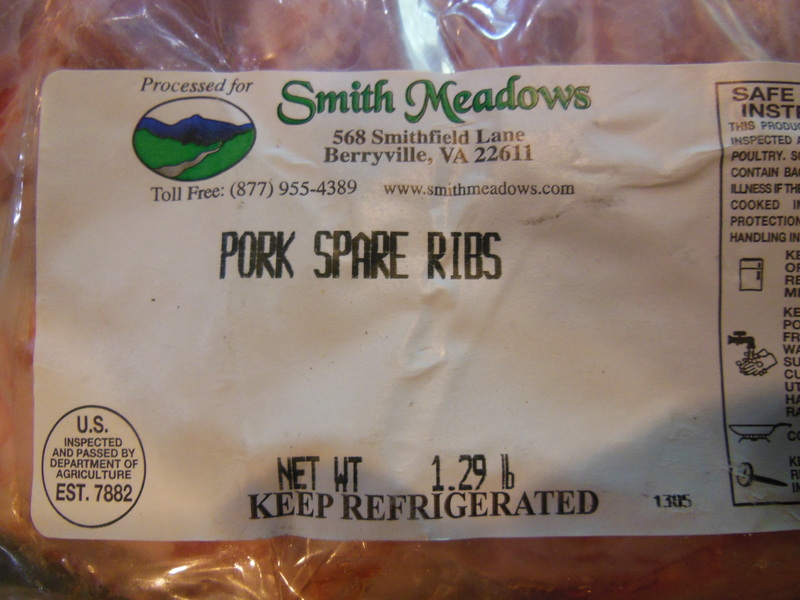 Once you are up to temp throw your ribs on for approximately three hours, being sure to monitor carefully. This recipe could be done on a gas grill with a smoker box, or a large charcoal grill with a dual-zone fire and a water pan on the low side. 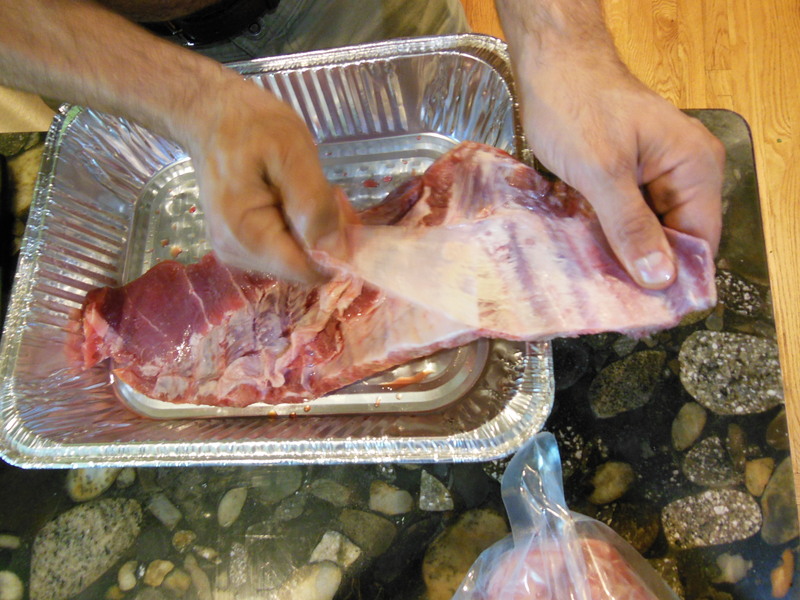 The meat should pull off the bone easily, but should NOT under any circumstances just fall right off. In competition BBQ that is considered a huge freaking failure, because you want the meat to have some “give.” Once they are finished you wont need to add much more sauce, because unlike an indoor(meaning incorrectly) cooked rib, you are tasting the smoke instead of just tasting the sugary sauce concoction that they are smothered in. No pink smoke = no bueno. 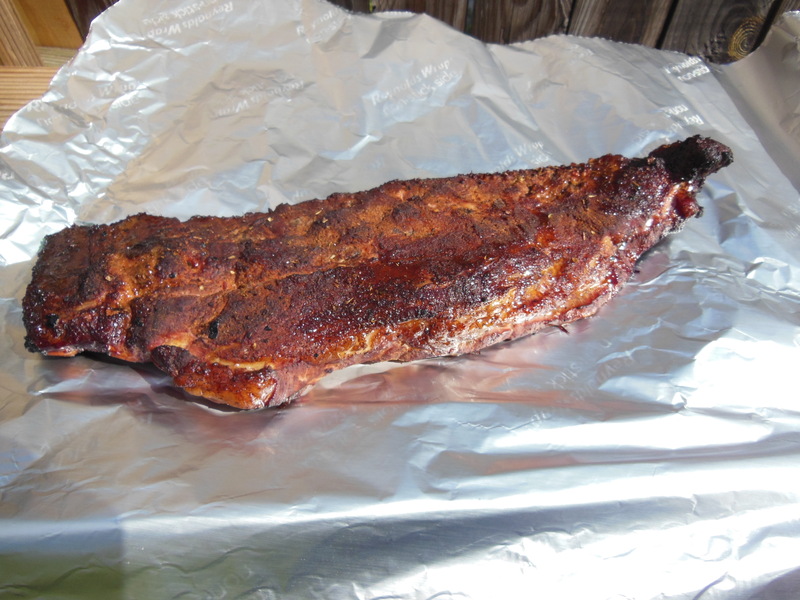 Lastly don’t forget to let your ribs rest for about 30 minutes in their foil, as they will be too hot to eat. November 22nd is right around the corner! You better get your technique right before November, because we put a down payment on a pig, and when he gets into our freezer and this website will be a pork-a-palooza!